I first saw Cian Nugent live last September at Hopscotch Music Festival, where we had the pleasure of seeing multiple sides of him both as a solo artist and with his “supergroup” Desert Heat. 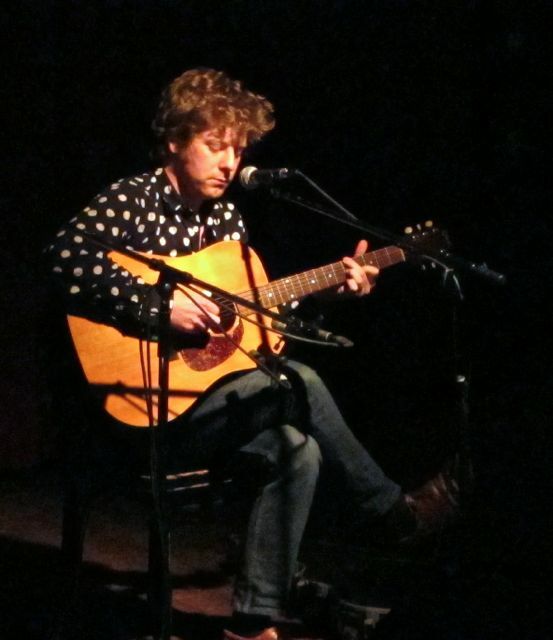 To date, the Irish guitarist hasn’t played regularly in the U.S., so there was no way I was going to miss him supporting fantastic new album at Union Pool. Here, the faithful were rewarded with Nugent working through solo versions of several standout tracks from his latest, Born With The Caul, as well as material from the seven inch release “Hire Purchase”, the only electric number of the night. The Wednesday night crowd rewarded Cian’s focus and concentration with an ample amount of their own, turning this sometimes-raucous room into a reverent space. With any luck, the reception from this tour will bring Nugent back to New York more frequently. This great artist’s catalog has much more ground to cover, as Pitchfork so presciently observed in a Marc Masters/Grayson Currin “Out Door” post recently. I recorded this set with a soundboard feed provided by Union Pool’s head engineer Ian MacCarthy, together with Schoeps MK41 microphones to provide mild room ambiance. The sound quality is excellent. Enjoy! If you enjoyed this recording, PLEASE SUPPORT Cian Nugent, like him on Facebook, and purchase Born With the Caul directly from No Quarter Records.